Deepak Chopra received the CIF Chanchlani Global Indian Award for 2012. He is one of the world’s leading thinkers on human empowerment and has been heralded as one of the Top 100 Heroes & Icons of the Century by Time Magazine. CIF created the CIF Chanchlani Global Indian Award to recognize an individual who demonstrates global leadership, vision and professional excellence, which has made people of Indian origin around the globe proud of their heritage. In addition to a specially commissioned trophy, the Award includes a sum of $50,000 which is given to a charity of the recipient’s choice. As the fourth recipient of the Award, Deepak Chopra joins a select company of previous winners: Sam Pitroda ~ pioneer of India’s telecom revolution, Tulsi Tanti ~ trailblazer in the deployment of wind power & Ratan Tata ~ India’s most respected industrialist and philanthropist. “By his words & deeds Mr. Chopra exemplifies those qualities of the Global Indian Award recipient”, said Rahul Shastri, National Convenor of CIF. As a global leader and pioneer in the field of mind-body medicine, Deepak Chopra is transforming the way the world views physical, mental, emotional, spiritual, and social wellness. He is a prolific author of more than sixty-four books, including nineteen New York Times bestsellers. His book “Peace Is the Way” received the prestigious Religions and Spirituality Quill Award in 2005, and The “Book of Secrets” was awarded the grand prize at the 2005 Nautilus Book Awards. His latest New York Times bestseller, “War of the Worldviews: Science vs. Spirituality” (co-authored with physicist Leonard Mlodinow), successfully elevates the conversation between science and religion in a way that is thoughtful and constructive rather than polarizing and divisive. Deepak Chopra is a columnist for the San Francisco Chronicle and Washington Post on Faith and contributes regularly to Intent.com, CNN.com, and the Huffington Post. In addition, he hosts the popular Deepak Chopra Radio show on BlogTalk Radio. 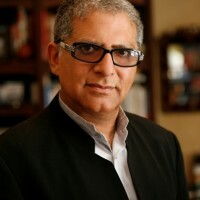 Deepak Chopra’s popularity as an international presenter and keynote speaker is exemplified by an impressive list of honorariums. For more than a decade, he has participated as a lecturer at the Update in Internal Medicine event sponsored by Harvard Medical School’s Department of Continuing Education and the Department of Medicine, Beth Israel Deaconess Medical Center. Dr. Chopra is a fellow of the American College of Physicians, a member of the American Association of Clinical Endocrinologists, an adjunct professor of executive programs at Kellogg School of Management at Northwestern University, a distinguished scholar at Columbia University, and a senior scientist with the Gallup Organization. Before establishing the Chopra Center, Dr. Chopra served as chief of staff at Boston Regional Medical Center. He received his medical degree from the All India Institute of Medical Sciences and did his internship at Muhlenberg Hospital in Plainfield, New Jersey. He then completed various residencies and fellowships at university-affiliated medical centers in Boston. Through the Chopra Center’s programs, retreats, and workshops, Dr. Chopra continues to expand humanity’s understanding of the crucial connection between body, mind, spirit, and healing.